Rotochopper wood chip processors turn dull tree chips into vibrant colored mulch in a single pass with a patented on-board colorizer, delivering the right size, texture, and color in a single pass. A Rotochopper wood chip processor sets up in minutes to produce “Perfect In One Pass” colored or natural mulch. We focused on customer input to develop the simplest system for turning wood chips from a liability into a profit center. Select a machine to find the right wood chip processor for your business. The demand for colored landscape mulch continues to grow throughout the USA and much of the world. In many regions, colored mulch remains the most profitable market for wood waste after more than 20 years of development. Our exclusive grind and color technology helps you capitalize on this market opportunity with unmatched efficiency. The CP-118 replaces the hassle of wood chip disposal with a revenue stream that lets you stay focused on your core business. 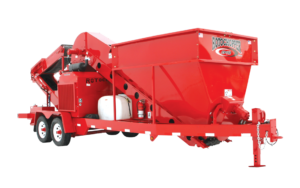 Scaled to the needs of the tree care industry, the CP-118 packages our patented grind and color system into a machine that is compact enough to be towed with a pick-up truck. The CP-118 is unlike any other machine on the market but shares the same customer-centric engineering designed into every Rotochopper. I like the compact size of the CP-118. It's simple to operate and you can tow it with a pickup.